Until the 20th Century drawing was inferior, a supplement amongst other fine arts genres according to the common knowledge. It was connected to the overall notion or graphic that included all work on paper, from unique and duplicated drawings to applied graphics. The exhibition in MODEM introduces the tendencies of unique fine art drawing from the beginning of modern Hungarian arts after 1945, its most exciting experiments and results through the artworks of more than 50 artists, from Lajos Gulácsy, Imre Bukta to Gruppo Tökmag, whose works had and still have significant role in the current expansion of drawing. The drawings of István Nagy, Lajos Vajda, Imre Ámos, Jenõ Barcsay and Béla Kondor still have the influence of a certain undefined spiritual inheritance up until today in Hungary. Free-hand, examining the roots of the national tradition of this important artistic medium, presents one of the emblematic pieces of the organic charcoal series of Lajos Vajda from 1940, sheets from the anatomy series of Jenõ Barcsay along with his artworks from the early 1950s, emphasizing the changing of the roles in drawing in the 20th Century and the stations of how it became an individual art genre. Béla Uitz, known from his robust pictorial world, one of the leading figures of Hungarian avant-garde will participate with his sensitive, fine studies in the exhibition. The highlighted classic examples create a dialogue with the works of the contemporary artists who interpret the genre more freely. The 1977 lined structures of Imre Bukta bring along the traditions of drawing, but we may also mention the works of Attila Kovács, Imre Bak, Dóra Maurer, György Galántai, Károly Kelemen, Péter Kovács or Sándor Pinczehelyi. The exhibition gives an insight into the experimental works of the frontiers of contemporary Hungarian drawing and puts emphasis on introducing the many-sided and diverse usage of this medium. Ádám Albert’s camera obscura that was made up after a thorough digital preparation, the microscopic portraits of Zsolt Asztalos, or the video animation, based on manual phases with graphite powder, by Júlia Vécsei are as much part of contemporary drawing as the space-drawings made of thread by Laura Somogyi, the installation ending in a wall drawing by Zsolt Tibor or László Gyõrffy’s occasional graphics, collected since 1994, closed in a hut. 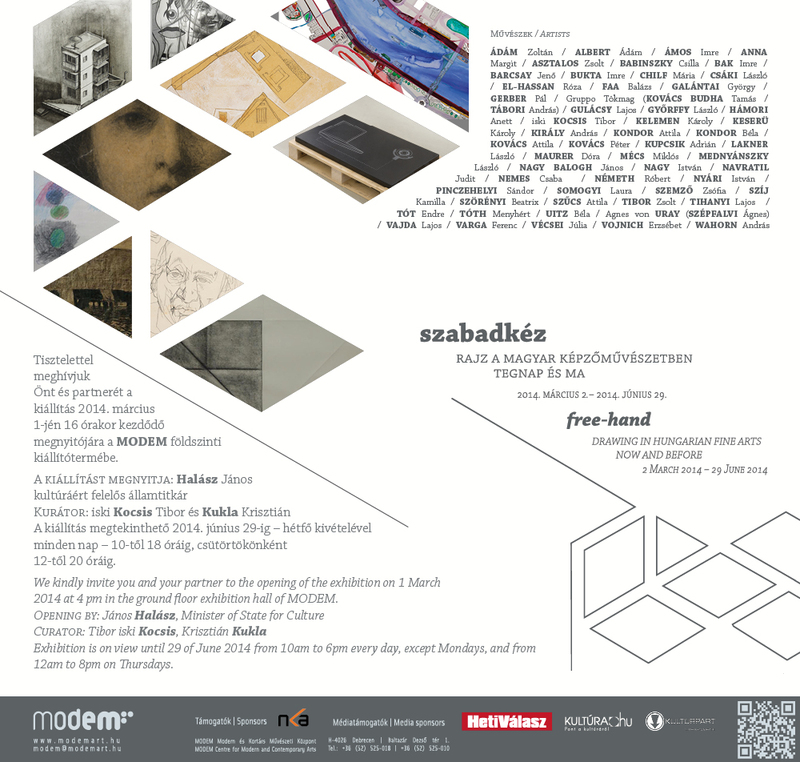 Several site-specific works are prepared especially for the exhibition in MODEM: Gruppo Tökmag (Tamás Kovács Budha and András Tábori) draws graffiti on the walls; the white walled exhibition hall utterly transforms inside Róbert Németh’s monumental, UV-lit drawing-box; Zsófia Szemzõ takes possession of the glass surface of the entrance, her drawing can be continued by the audience. 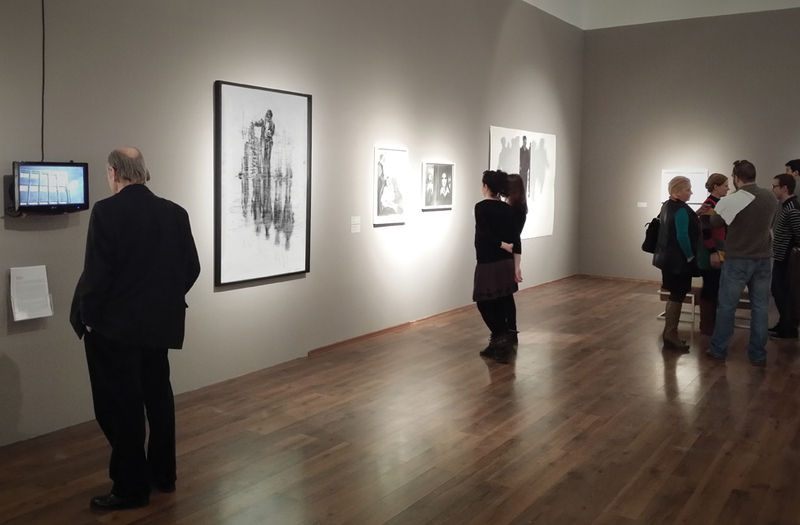 Those, who are more into the solutions of traditional techniques, can view Pál Gerber’s pencil drawings that were made in his different artistic periods, or the large charcoal drawings of Attila Szûcs and the postcard-like, fine ball-pen works of István Nyári. Video works are also on display in the exhibition hall, such as one of the latest chalk animation films of László Csáki, for instance. The curators of the exhibition (Tibor iski Kocsis and Krisztián Kukla) do not lead the spectators through the show chronologically but draw their attention to the fineness, sensibility and intellectual depth of the drawings through their individuality and their emerging dialogues.